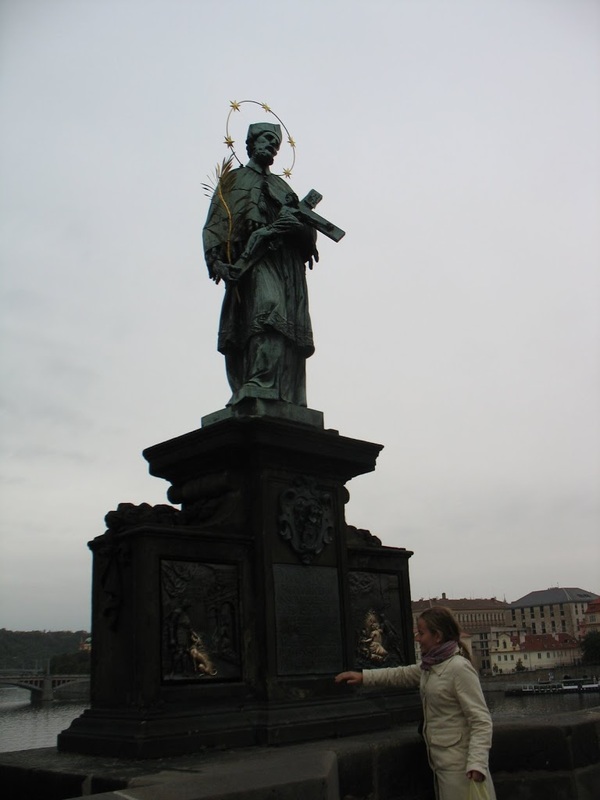 John of Nepomuk is the national saint of the Czech Republic. he lived during the 14th century and was reputedly the confessor of the wife of King Wenceslas IV. he studied at Charles University in Prague (which was established around the time that he was born) and later at the University of Padua. he became the vicar-general to the Archbishop of Prague, who had a contentious relationship with the king. according to legend, John of Nepomuk served as confessor to the queen in and, when he refused to betray that relationship to the King, who suspected his wife of infidelity, the King had John of Nepomuk tortured. when the latter died under torture, the perpetrators panicked and threw the body into the Vltava River. the body surfaced several days later and upon examining the body, legend holds, it was discovered that John of Nepomuk’s tongue had curled up, which the Catholic Church took as sign of a miracle and John’s commitment to the sacrament of confession. the real story of John of Nepomuk and his death/execution/martyrdom proves significantly more convoluted and hazy. who would imagine that over seven hundred years a story would get re-told and re-imagined to suit shifting political and religious goals? one historically viable account holds that John of Nepomuk was trapped by the political machinations of Wenceslas (who was King of the Romans and King of Bohemia) and the Archbishop of Prague and, in siding with the latter, earned the King’s wrath. the political issue that sparked this contention was the appointment of a new abbot to a powerful abbey, one who would prove a vital ally for the King against regional nobles. additionally, while the King backed the Avignon papacy during this period, the Archbishop backed the pope in Rome. John of Nepomuk confirmed the Archbishop’s choice for abbot and, as soon the King concocted a viable explanation, the King had him killed and thrown in the Vltava on March 20, 1393.
whatever the real story, the man is clearly venerated by the people of the Czech Republic and there are statues all over the country in spite of the communist regimes best efforts to stamp out religion. Benedict XIII canonized him in 1729 and centuries spent weaving the story into national identity and folk heritage cannot be unraveled by a couple of decades of repression, no matter how oppressive.